This blog is the third in a series written by Sarah Woodman Kansteiner, a former Marine Corps Public Affairs Officer, military spouse, and mom. When I signed our family up for FOCUS, one of my main goals was figuring out how to handle the bewildering amount of time my husband was expected to be deployed. We’d done the six or seven monthers, but a whole year? Goodness, this amount of time had magnitude. I’ve done a few things that seemed overwhelming at the outset—like finishing an Ironman triathlon and having a baby while my husband was deployed—but this was just staggering. More like an expedition to Everest really, and it seemed pointless to try to struggle through on our own. Even professional climbers enlist Sherpas, right? Ideally, I wanted to find a way to count down the days in some way that didn’t involve weaving three hundred and sixty five strips of paper into a depressingly long chain. Something that genuinely acknowledged the deployment’s substantial length (I’m not one for sugar-coating things just to make my kids feel better in the short-term), but also enabled us to see some progress along the way. Thankfully, I was in good hands. Our FOCUS counselor introduced us to an ice cream cone countdown system, which we began as soon we told our kids about Daddy’s upcoming deployment. This was in January and he didn’t end up leaving until early February. We explained that from now on we would all have ice cream on the first day of each new month, but while we were enjoying our scoops, we would also use this time to talk about what would be happening during that month. This was part one. Part two involved an easy craft project for the kids at home: making a construction paper ice cream cone. Nothing fancy and nothing we needed Pinterest to accomplish. First, the kids cut out a big cone which we taped to the bottom of our sliding glass door in the kitchen. Then, they cut out a scoop for the month of January. I scribbled our significant events onto it as we enjoyed our ice cream, leaving a space for a check mark next to each item. When we got home, the kids taped our first scoop atop the cone and life began to revolve around this ever-present, ever-growing ice cream cone. The kids began checking things off as they happened and knew, or were reminded, what was coming up next. 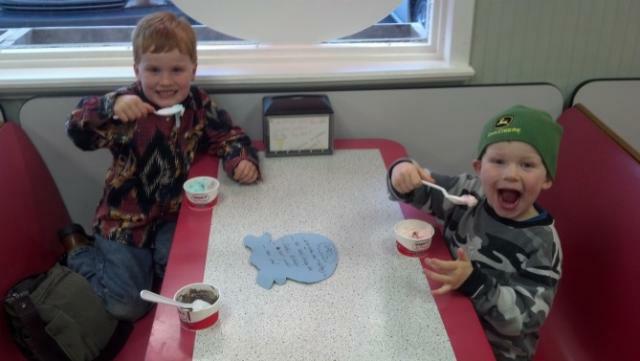 When February 1st rolled around, the kids knew it was time for more ice cream. They cut out another paper scoop in a different “flavor” and we all enjoyed sugary spoonfuls of the real deal while we talked about what was coming up. I listed each coming event on our new scoop, careful to point out which things would happen before Daddy left and what would happen after. It was a somber sit-down; we all knew there would be more ice cream on March 1st, but Daddy wouldn’t be there with us. When we got home, we taped up our new scoop and life really felt immediate. We only had about a week left before Daddy would have to leave and our February scoop reminded us every day. But, we could also look one line down and be reminded that we were planning on going to a family fun day on base, complete with cotton candy and pony rides, shortly after Daddy left. Amidst the sadness and pending reality of saying goodbye, thankfully there were still a few things to look forward to. When D-Day came, we all got up early to drop Daddy and all his gear off on base. We hugged, we cried, and after we said goodbye, we stopped at Dunkin Donuts for doughnuts with sprinkles. Then, we came home and attended to our business: checking off “Daddy leaves” on our February scoop and making our way through the rest of that raw first day. We were at the bottom of our door at that point. We had many, many months to go until we reached the top, or August, when we expected Daddy to come home again for his two-week R&R period. There weren’t any shortcuts to our finish line, but every time we checked something off, we edged closer and closer to the top. This was the beauty of the ice cream cone countdown—it helped set accurate expectations for all of us, effectively breaking down the deployment into more-manageable, monthly bites and offering up a sweet reward every time we made it through another thirty days on our own. Even with this seemingly ingenious ice cream countdown in place though, I quickly realized it really only represented half the answers my kids needed. I was still asked every day, multiple times a day, “when is Daddy coming home again?” I tried to stick with my “when we reach the top of the door” line, but my youngest would often follow up with, “and when is that?” August was the month we hoped to see him again, but this answer really only held measurable meaning for our oldest son, James, who was five. Telling Cole, our three-year-old, August was every bit as useful as telling him Daddy would be coming home during National Goat Cheese Month. Uh huh, and when is that? I felt like I owed Cole an honest answer, one that he could grasp better than August, but I was stumped for a good way to define things. How do you explain six or seven months to a kid whose world seems to revolve in sixty second revolutions of what I want now, what I want next, and what my brother has that I also want. Finally, one day it just hit me. When he asked, “when is Daddy coming home again?” I immediately responded with, “about a billion days.” It was the most mythical of answers, yes, but Cole instantly got it. He knew enough to know that a billion was a long, long time from now. It wasn’t around the corner, it wasn’t next week. It wasn’t next month, or even the next one after that. This was way out there. This was, quite honestly, about a billion days. I stuck with this answer, repeating it time and time again, right until we closed in on a time he could wrap his head around. Next month, next week, tomorrow! After Daddy had come home for R&R and left again, I somehow had the wise idea to adjust my answer slightly. About a billion days became half a billion days, acknowledging that he had already endured half of the separation. One part was done, one more to go. This he knew, this he understood. Looking back, this whole process of learning how to deal with the days seems to reinforce two of the most unfailing truths about life: One, there doesn’t ever seem to be one “magical” answer. And two, ice cream solves everything. I wouldn’t willingly go back and re-live our year without Dad, but it constantly surprises me that it wasn’t the worst year of our lives. Thanks to FOCUS, we actually emerged a stronger family unit, accustomed to talking about what’s about to happen and attempting to set accurate expectations. This habit continues to serve us well, making us better able to withstand all the crazy things life has in store for us, such as learning we would be moving to California a couple months after Daddy got home. How long does it take to drive to across the country, Mom? About a billion days, son.